Adding a piñata to your child's party can be great fun. You can make your own or purchase one. Then there is the candy and toy selection and rules for usage to handle. After that the kids can start swinging. This page contains piñata tips and tricks. 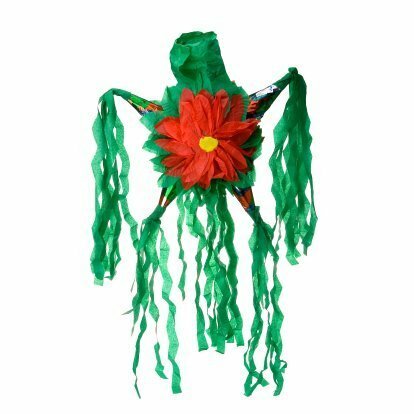 A pinata at a fiesta is great fun, but can be very dangerous if the hitter is still swinging when the pinata is broken and the kids rush in. I organize this activity by instructing the kids that no one can move until I blow a whistle, or yell a word really loud like "ARRIBA" meaning it's safe to run. As a teacher, I once had a child nearly stampeded to death so I now err on the side of caution. It's a good idea to have an extra bag of treats available in case some of the less aggressive kids don't get much. This is a guide about making a piñata. 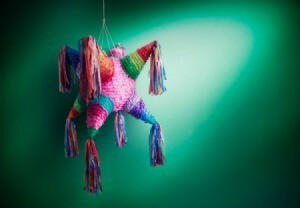 Piñatas are a great addition to any party. Instead of buying one premade, why not try making your own? For children's birthday parties, buy small toys, stickers, candy and crepe paper streamers. Wrap the toys in the streamers one at a time creating a ball. You can make it as big or small as you like. Have the children toss the ball in a circle, as it unravels the toys will fall out. This is much safer than a pinata. Also, the kids love the streamers. I just had a wonderful birthday party for my 9 yr. old daughter that was the most stress free ever. We did the usual Zoo and pinata thing etc. but it was how I did the pinata this time that was the hit of the day. Usually there is a free-for-all when the pinata breaks and confetti and candy goes everywhere. We have used a large tarp to keep things in place but there was always the usual "I had that first", "I didn't get one of that", etc. This year I used my trusty (but old & cheap) vacuum sealer to make long narrow bags (that could fit through the opening in the pinata,) to hold the candies, etc. When the pinata broke, each child had exactly the same stuff. They were all thrilled with the new concept and I had one less headache of trying to divide stuff evenly and fairly.